Still as feisty at 71 years old as she was during her ABC News heyday, Carole Simpson is truly a pioneer in the field of broadcast journalism. Current journalists like Robin Roberts have acknowledged Simpson as their forbearer and role model, an outspoken African American female in a business that was long a boys’ club. From the beginning, Simpson has not been afraid to be different. Growing up on the South Side of Chicago, Simpson was singled out for her good grades, attending a predominately white high school where she excelled in academics and extracurricular activities. It was there that she joined her high school paper and realized she wanted to be a reporter. When Simpson graduated, there were few careers and fields for an educated black woman. Simpson was encouraged by her high school guidance counselor to become an English teacher instead, citing the lack of female black reporters. Even her parents expected she would become a teacher. Simpson’s determination carried to her studies; she excelled at the University of Michigan, where she honed her craft at the school paper. She was the only African American to graduate in her class. Simpson was the only graduate that couldn’t find a job—something she blames on discrimination. She later took a job at the Tuskegee Institute in Alabama, a frightening experience for a young black woman in the tumultuous South of the early ’60s. At Tuskegee Simpson experienced her first sexual harassment, personal experiences with the segregated South, and issues with “colorism,” or prejudice because of skin tone. While initially interested in print journalism, a chance class at the University of Iowa changed her mind, turning her on to radio. Simpson began her career at WCFL in her hometown of Chicago, later moving to television at Chicago’s WMAQ. 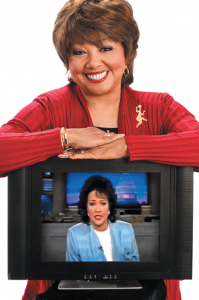 At WCFL and WMAQ Simpson encountered notable racism and sexism, experiencing sabotage from co-workers intent on her failure. In the worst cases, they would steal her tapes or tell her the wrong address for an interview. Others targeted her for having a young child while working full-time, accusing her of being a bad mother. Despite these obstacles, Simpson made a name for herself. She does acknowledge, though, that much of her success was due to changing times and the need for the token woman or African American. Much of it, too, was due to her talent, hard work, and perseverance. “The handicaps that I had, of being black and female, were suddenly advantages [in the ’60s]. People were anxious to hire me, because the civil rights movement was happening, and they needed black reporters. I came along at the right time, at the right place, and ended up getting hired as a news reporter,” says Simpson. During her time in Chicago, Simpson interviewed Dr. Martin Luther King, Jr., reported on the Richard Speck trial, and the riotous 1968 Chicago Democratic Convention. Simpson gradually made a name for herself in her hometown, leading to a job with the national network. 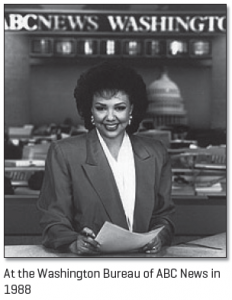 Simpson joined NBC News in 1974, becoming the first African American woman to anchor a major network newscast. She later joined ABC News, serving as the anchor of the Sunday edition of World News Tonight from 1988 to 2003. While at NBC and ABC Simpson still faced discrimination, although more subtly. It was often revealed in not receiving the “beats” she wanted. Instead of the hard-hitting political news she wanted to cover, Simpson was given, as many women were (and still are) undemanding positions that were rarely newsworthy. Her anger at the insolence and pattern of discrimination from her superiors led her to band together with fellow female employees (and later, African American employees). They compiled data and eventually presented it to the corporate executives that were mostly unaware of such treatment. 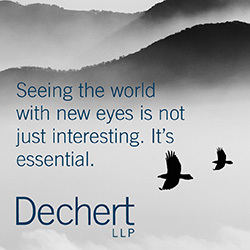 In some ways, her anti-discrimination campaign and subsequent demands, like a pay equity study from a third party and joint committee meetings, were precursors to the corporate diversity so familiar today. Simpson’s career high, as she likes to say, was moderating the second presidential debate of then-incumbent George Bush and Bill Clinton in 1992. She was the first woman and minority moderator. This, like many of her successes, was due to an outcry for a woman or minority moderator, a position that had long gone to the older, white anchors like Tom Brokaw and Peter Jennings, certainly not to the weekend anchor of the evening news, and certainly not to a black woman. But seemingly in the early 2000s, Simpson was ousted from her longtime employer, ABC. The changes to ABC News that began in the mid-’90s, her reputation within the company, and her advancing age slowly pushed her out of the position she had held for decades. Despite this seemingly insurmountable setback, Simpson has gone on to a second career in the field of higher education. She continues to give back to the community and causes she feels most importantly about, especially education and women’s rights. She now works as a journalism professor and Leader in Residence at Emerson College in Boston. Her tireless work with Africa, first inspired by a trip to South Africa during Apartheid, includes donating thousands of dollars to establish the Carole Simpson Leadership Institute. The Institute, founded to help female journalists around the world, has trained more than 100 women since its inception. Super article. 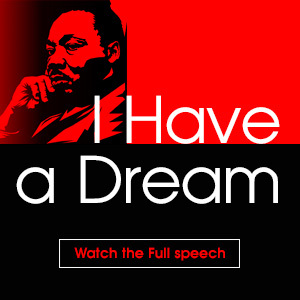 I am using this valuable information to present for our school black history month, segment.